Success!! I took advantage of the beautiful sunny evening and finally managed to take acceptable pictures tonight. I used the opportunity to finally photograph my Simplicity 3867 top. This review is long overdue. This top was the first project I managed to tackle after my grandma passed away; which means I made it last June. 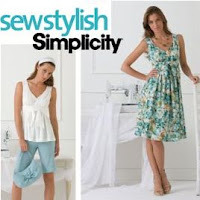 When I bought Simplicity 3867, I originally wanted to make the dress from the pattern. However, Seb told me I had just made a bunch of frocks – why not make a top instead? So, a top it was. The fabric is a Swiss dotted cotton which was given to me by one of Seb’s grandmas – it was in the stash of one of her friends, who loved sewing and died last year (I already used a red fabric from that stash). I also have a memory of my grandma using Swiss dotted cotton for a dress for my older sister (that was before I was even born, but we still have the dress). 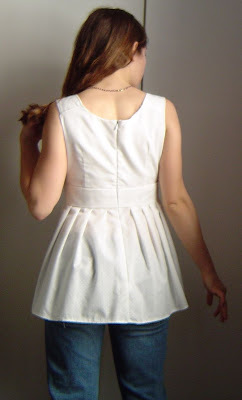 Besides, since the top has all those pleats just above the waist, I wanted something thin and airy in order to avoid adding extra bulk as much as possible. The Swiss cotton is so lightweight that it is see-through. Consequently, I lined the upper bodice with the same fabric, and had my first experience with sewing sheer fabric. I had just received my first (and last??? Never got the Fall one and they’re now discontinuing subscriptions) issue of SewStylish, and they explained very well how to sew with sheers. 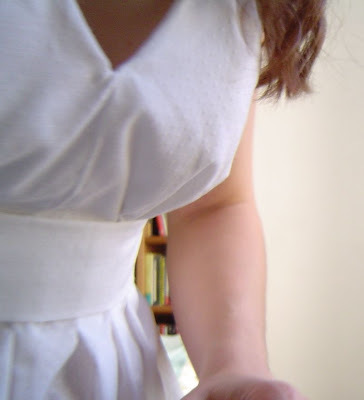 I did French seams to construct the garment, so as to avoid unsightly seam allowances showing through. (Sylvie, that is what I wanted to explain to you when you showed me your sheer blouse in progress). I’m proud of this garment – it looks as good from the inside as from the outside (when I take it out of the washing machine, I have to look twice to check whether it’s inside out!). For obvious reasons, I wanted to do the best job I could with it, even though tears were often streaming down my face while I was sewing it. 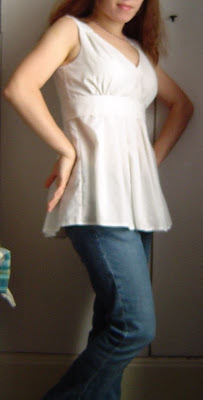 It was a bitter-sweet experiment and it took me months before I felt like wearing that top. Conclusion: this is definitely not the most flattering top I own, but so what? We don’t always need to look our slimmest, do we? Who cares if it makes me look a bit bigger than I am. I love the details in that design. The pleats at the waist and shoulders and gathers at the bust are so pretty. A final one, just for fun: this is what happens when you’re photographing yourself and forget to set the timer! At least you can see the raised dots in the fabric if you click on the picture. You can read a more thorough review here. Your top is really cute! Ihave this one cut out but havent made it just yet. Isabelle, are you kidding? That top looks marvelous on you! And I love the French name for french seams. Adorable top! Pretty and so full of meaning. I did get a laugh out of the french for french seams! Figures, doesn’t it? Oh my goodness, Isabelle, that’s just stunning! This is so cute, Isabelle! And you look wonderful! I think the top is adorable.And if I looked that good without make up, I wouldn’t ever wear any! Just a beautifull top and it looks great on you. I just love that pattern – your version is so cute! What a darling top on you, Isabelle!! Very cute top. I love French seams (couture anglaises 🙂 ), they make a garment feel that much more special. I really like this one you. Nice job. Pretty top…and you must have deleted the bad photo of you, ‘cos I couldn’t see it!! You look gorgeous! I like it! I have a thing for crisp white tops (or soft billowy tops) in any style. Very pretty top. You wear it well. Lovely fabric. Lovely, when I saw your top appear on PR I thought you were going on holiday! To make such a summery top now when it’s getting colder every day. But see now that you made it earlier. For me too the smile when I read the French name for the “French seam”. It’s gorgeous Isabelle and you look lovely in it 🙂 A beautiful bit of sewing. By the way, I love the French for ‘French seams’ too! I LOVE it!!! It’s gorgeous! You did an outstanding job with this project, dear Isabelle!!! Hello my dear friend !Your top is really cute, you look like a little fairy …Ah, when french and english langages meet … it’s always worth knowing …Big kiss and good evening ! Great job on the top…it looks really nice! I think the blouse looks just right on you. You are such a talented seamstress that whatever you make it fits perfectly. A lot of it is so much about fitting isn’t it? Even a lovely looking pattern would look ugly if not fitted and stitched properly.Thanks for your comments Isabelle. I have been quite because life has been a bit busy so I have not been able to sit on the computer for long. Also I have to finish projects that are pending besides doing my art homework as well as other chores at home. All in all it just takes up time. Not complaining though I do like to be busy. I love this top, Isabelle! I think I might have to find this pattern. You are starting to get me hooked on sewing. I might even upgrade my sewing machine sometime in the next month to one that can do embroidery as well! Another cute top! Love the little dots on the fabric. I hope that you find a good solution for taking photos of yourself. This is not a problem I have, since I hate to have my photo taken. Maybe one day!